On September 22, Jonathan and I joined the rest of Oslo in celebrating the Autumnal Equinox. We followed the crowds down to the Akerselva River walk in Grünerløkka, and snapped photos all along the way . Night lowered itself over the city, flooding the winding river canal with shadows. 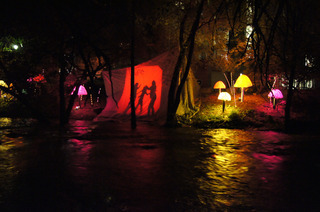 Colorful light installations glowed at every other turn. We saw fairies, giant mushrooms, an enormous dragon kite leering from behind a building in vicious shades of pink and orange. We stuffed our hands deeper into our pockets and walked slowly with everyone else. There was muffled laughter and catcalling in Norwegian, all of it made somehow more sinister by the darkness and the otherworldly images around us. Several different small choirs had gathered to sing traditional songs. Their breath puffed white as they sang. We stopped for waffles and jam at a stand near a bridge. The pastry was hot through the napkin and warmed our hands, though just for a moment. All of the color and fluid light, candle flames dancing in the windows, reminded me of why I love this season so much. It's the spirit of the people, children beginning anew at school in spite of the way the natural world is drawing itself to an end, young people dancing in pairs and trios, stretching their mouths carelessly around every lyric, and old people standing back, wrapped in the wisdom of their experience, considering the minor beauties of this time from a place most mindful and most appreciative. Recently in Norwegian class, Jonathan and I learned a new verb: å glede seg . It means to look forward to, or to anticipate. So what am I anticipating this season? Mom passed along her scrumptious pumpkin bread recipe to me the moment I asked for it. It was the fall of 2005. I'd been married a full year and hadn't baked a thing in my new kitchen. She came over and walked me through the recipe, swiping the flour flat in the measuring cup, scooping the pumpkin goop from the can into the bowl, and showing me how I should err on the side of extra with the cinnamon. Since then I have baked it several times each autumn. Here in Oslo, though, a single can of pumpkin costs something around $12. Pumpkin bread will be a luxury for us here, but as the days retract into darkness and the cold wind forces us to close our windows tight, I look forward to pulling golden-brown loaves from the oven and letting the scent of cinnamon, cloves, and pumpkin fill the flat. Walking in the fall is more fun than it is any other time of the year. The sidewalks are covered in a deep, crunchy blanket of leaves, brightly colored and dry and light as air. Every step kicks up a few so that they tumble into new piles around me. If I move fast enough, they whirl a bit in my wake. I like to stand on our street when the wind begins to blow just to watch the yellow and red leaves in the trees release their hold on the branches and take their fluttering, circuitous journey downward and into my path. Here the wardrobe change has happened quicker than I'm used to. In California I would wear sweaters from November through the beginning of March. In Oslo, sweaters are necessary from the beginning of October all the way into April. The thick woolens feel soft against my skin. I layer a scarf around my neck, swirling and tying it so that it protects me from the cold fingers of the wind. I am wearing overcoats and rain coats. Soon I'll be pulling on a parka! But for now, I'm excited to be reunited with all my colorful sweaters. Selecting pumpkins has always been an important part of the season for me. Jonathan and I used to make a whole day of it. We'd drive all the way to Monterey to visit the pumpkin patch I knew from my childhood, the one with the sign advertising "Aunt Audrey's Pie Shoppe." Over the years, we ignored the rising cost of gasoline and the rising cost of pumpkins. It was all in the spirit of the season. The trip meant we could stop at the beach and play Frisbee, daring each other to step into the icy Pacific water. The perfect pumpkin is large enough to accommodate a fun carving pattern across the face, but small enough to wrap in a secure and comforting hug. Once we had ours, we would seatbelt them into the back seat and drive home. The Norwegians don't celebrate Halloween on the whole. There are costume stores, and I would bet that there are kids in the suburbs of Oslo who will trick-or-treat. But I've been told we won't see that kind of thing in the city. And there don't appear to be pumpkin patches anywhere nearby, either. The produce market on the corner has pumpkins for sale, and they aren't expensive, either. Though I suppose that's because the Norwegians think of them as food. I fully intend to buy a couple, carve jack-o-lanterns and put them on our patio this year. Maybe we'll start a trend! Taking on the corn maze at Del'Osso Farms in Lathrop, California every year is a tradition I held dear until 2009. It's one of the largest and most elaborate corn mazes in the country. And they certainly know how to pack the crowds in. These days, according to their website, 125,000 people visit each October. I used to be one of them. But as its popularity grew, it was tough to continue enjoying the trip. Everyone knows how important it is to visit a corn maze at night. With flashlights. A steady hand. A stout heart. Nothing is spookier than a corn field at night, the stalks menacing overhead, stabbing up at the starry sky. Peering around every corner, choosing your way on a whim, hearing fellow lost souls crying out in the night, desperate and scared and laughing because it's ridiculous to be so easily made desperate and scared. It gets the adrenaline pumping. When you're packed into the maze elbow to elbow and you can't lose the obnoxious family behind you as they bicker in high, self-important tones about the map, it's less fun. There is a corn maze at G&M Farms in Livermore, too, smaller and quieter as I recall. Last year we met my mom and our nephew, Jacob, and watched him ride a pony, roll in the hay, and pick out a pumpkin. It's the simple things in life that make it so worth while. Every year I pull out my favorites and subject Jonathan to them, one by one. He loves it. Arsenic & Old Lace (1944) A young dramatic critic makes the mistake of visiting his two elderly aunts on Halloween night when he should be leaving on his honeymoon. When he learns of their new, macabre hobby, Mortimer Brewster (Cary Grant) goes to all possible lengths to protect them from harm (and from harming anyone else!). Meet Me in St. Louis (1944) Four sisters come of age in St. Louis, MO at the turn of the last century. While the older girls (including Judy Garland) are focused on the boy next door, the younger girls (Margaret O'Brien) get into all sorts of trouble around town, especially at Halloweentime. There are more. Young Frankenstein, The Male Animal, You've Got Mail, To Kill a Mockingbird. It's a good time for movie watching! And, of course, I cling to Halloween as the one day each year where it's not crazy for me to wear a costume. 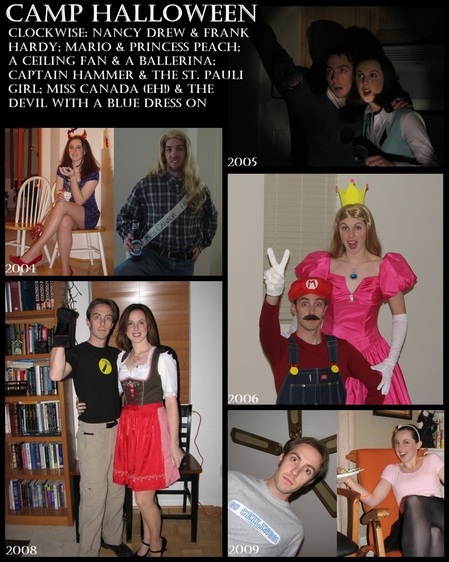 Jonathan and I have taken our costuming very seriously in the years since we've been together. One of our first dates was the week before Halloween in 2002. Jonathan had called and asked if I'd help him dye his hair black for his costume. I barely knew him, but I didn't mind spending a couple of hours with my fingers tangled in a cute guy's hair. So I went. And we fell in love, so that was a good call. Anyway, with the exception of a couple of years when we've been traveling (2007 we were in Denmark, 2010 we were in the air bound for Australia), you can see all of our fabulous costumes here. My favorites are Mario and Princess Peach. I bought the pink prom dress on eBay. Totally worth it! There is a restaurant here in town that is holding a costume party, but I'm still deciding whether we can make it. Costumes are required, and we didn't pack a single thing. That pink dress is all locked up in our storage space back home. And while I do have my Swiss dirndl with me (it's real; I picked it up at a little shop in Appenzell, Switzerland), Jonathan rightly pointed out that it may not be considered a "Halloween costume" in this part of the world.